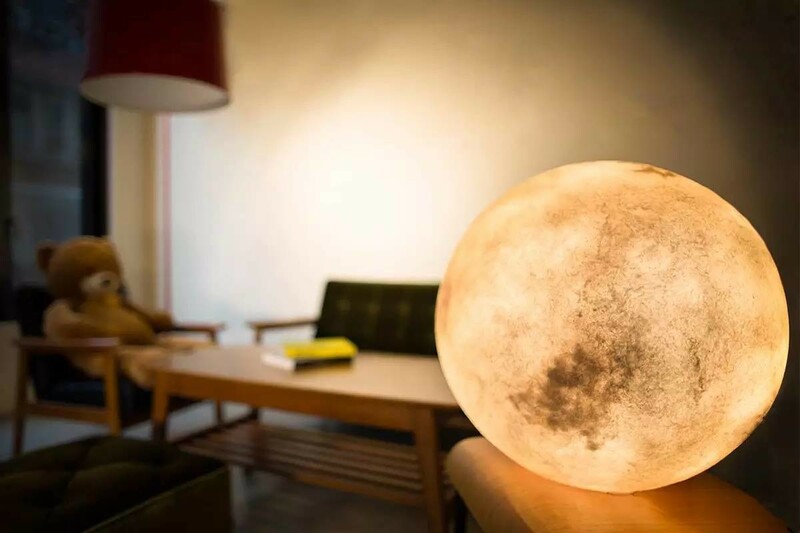 The Luna Moon lamp will let you enjoy a full moon 24/7 in any environment. Image Source: Indiegogo. At every 30 days the moon goes through four phases, and at every month we are all gifted with the most beautiful one - the full moon. It has inspired writers, lovers and philosophers across time, and whenever it appears on a clear sky it is a fascinating spectacle. So what if we could count on this marvel that is the full moon to inspire us all month long, every day and night, by simply turning it on and off? This may sound as a poet’s deviation, but in a certain way it is made possible by the Taiwanese design company Acorn Studio. They created Luna, a moon shaped fiberglass structure lit from the inside. The Luna lamp comes in different sizes to fit perfectly any room or area. Since it is handmade, the surfaces are never the same. It is also dimmable, so you can control the luminosity. The smallest version is battery operated and lit by a LED bulb instead of a halogen one. The Luna lamp is perfect for a romantic dinner, for writing or perhaps simply appreciating along with a glass of wine and your favorite tunes. Find out more about this idyllic project at indiegogo or simply watch the delightful video.